The Algarve, the southern Atlantic façade of Portugal, is home to 100 miles of popular golden beaches and clear, green water. From west to east, the region stretches its arms from Cape St Vicent to Castro Marim, sweeping up well-known Albufeira along the way. Conquered by the Arabs in the fifth century, the Algarve retains a distinct architecture of white houses covered in ceramic blue ?azulejos'. But since the opening of an international airport in Faro, tourism has become the region's principal activity and its beaches now cater to the hordes of summer tourists who come in search of sun, sea, sand and golf. But take a short trip inland and you'll discover a region committed to nature - hillsides covered in flowers, abundant nature reserves and, to the west, stretches of truly wild coastline. 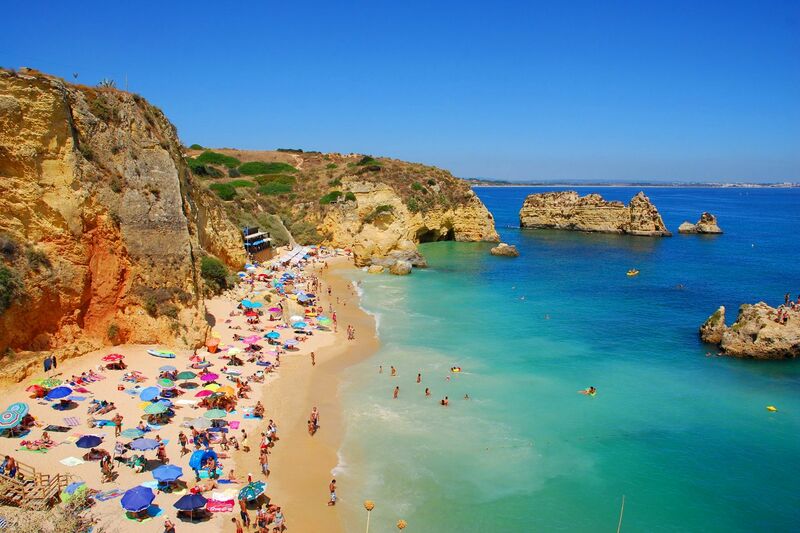 The best time to enjoy the Algarve is during the spring or the autumn, when temperatures are pleasant and you have a little more space to enjoy the ram-packed beaches of the summer months. The region is also one of the best places to try your hand at water sports, offering courses in everything from wind surfing, sailing and speed boating. Golfers are also extremely well-catered for, with 24 different courses at Penina, Vale do Lobo and Vilamoura to name just a few of the better known. +A varied and protected countryside, such as the Formosa natural park and the Catro Marim reserve. The Algarve is well-known for its traditional dances and music. The corridinho is quick and light-stepped, danced by a circle of constantly revolving couples, whilst the traditional leva leva song of the fisherman can often be heard in and around the region's ports. Aside from tourism, the region relies on fishing and agriculture to make a living - harvesting everything from bivalves (molluscs) to figs, almonds and chestnuts in the autumn. Algarvian food is, simply put, delicious. From a seemingly endless spectrum of seafood and fish, to tempting desserts packed with almonds, eggs and figs, the Algarve's culinary offerings have something to suit every taste bud. Amongst them, you'll find the Queen of the region's specialities - the 'cataplana' - a specially designed cooking pot which has given its name to the famous dish it holds. Grilled sardines are served with almost every meal and for fish fans, it's always a safe bet to try the fresh catch of the day. Handcrafts and craftsmanship are extremely important to the Portuguese way of life, particularly in the Algarve. You'll find beautiful ceramic work all over the region and some particular specialities in the village of Porches, which sells wonderful vases, crockery and coffee sets. If it's culinary treats you're looking to bring home, make sure you find a bottle or two of Porto - Portugal's famous fortified wine - or even sardine paté, which is often served as a starter in the region's restaurants. Our journalists' reviews for you 70 hotels Portugal . Take a look at our hotels, their facilities or their value-for-money score according to your departure dates so that we can find the best offer to suit you Portugal . Book a hotel Portugal it's never been so simple !